Preparing your Thanksgiving turkey in this manner is, without a doubt, a time consuming project, but will worth the effort. The white and dark meat cook evenly and more quickly than roasting a whole bird, and carving it is much easier. Cutting up and deboning your turkey, making the turkey stock, and preparing the stuffing up to two days in advance can save valuable time and effort on the day of the meal. Be sure to save the roasted giblets for the last steps in making your gravy. For the rich turkey stock: Heat the oil in a large heavy-bottomed pot over medium-high heat. Add the turkey neck, bones and any meaty trimmings; sear on all sides until nicely browned. This can take about 15 minutes total. Transfer to a plate, then add the onion, carrot and celery, stirring to coat in the pan fat. Cook for about 10 minutes, stirring, until browned at the edges. At this point, the giblets (heart, liver, gizzard) can be added and sauteed until lightly browned, if desired. Transfer the contents of the pot to a plate; reserve for later use. Use paper towels to wipe out any fat from the pot. Place it over medium-high heat; when it is quite hot, add the broth and use a wooden spoon to dislodge any browned bits in the bottom of the pot. Add the bones, trimmings and vegetables, stirring to combine, then add the bay leaves and thyme, 1/4 teaspoon of salt and a few grinds of pepper. Once the liquid starts to bubble at the edges, reduce the heat to medium or medium-low and cook for 30 minutes, occasionally skimming off any foam or scum that rises to the top. Then cover and cook for 1 to 1 1/2 hours, during which time you can add the heart and gizzard to cook for 15 minutes and 45 minutes, respectively, then remove to cool and reserve for later use, if desired. Strain the stock through a fine-mesh strainer into an 8-cup container, discarding the solids. You should have about 6 cups. Taste, and adjust the seasoning as needed. Cool to room temperature, then cover and refrigerate so that any remaining fat rises to the top and can be discarded. For the stuffing: Line a bowl with a few layers of paper towels. Heat a teaspoon or two of the oil in a large skillet over medium heat. Add the sausage meat in several pinches/pieces. Cook for about 5 minutes, until it is no longer pink (but not fully browned), stirring often to break up the meat. Use a slotted spoon to transfer to the paper towel-lined bowl to drain. Add the remaining oil and the butter to the skillet; increase the heat to medium-high and add the onion, celery, mushrooms, sage, salt and pepper, stirring to combine. Cook for about 8 minutes, stirring occasionally, until the vegetables have slightly softened. Return the drained sausage to the skillet, then add the broth and cook for about 1 minute, stirring. While the vegetables are cooking, place the cornbread cubes in a large mixing bowl. Add the cooked vegetables and sausage, and toss to combine, crumbling some of the cornbread to form a stuffing that is moist yet loose. Taste and adjust seasoning as needed. Cool completely, then cover and refrigerate until ready to use. For the turkey: Discard any pieces of fat or excess skin and any pop-up plastic timer. Use paper towels to pat the turkey dry, and place it on a large clean cutting board. Use a sharp knife to dislodge and remove the wishbone. Use the shears to snip off the nubbins and smaller parts of the wings. Use a large butcher’s knife to carefully cut off the ends of the drumsticks bone; discard the nubs. Use a sharp knife to cut the leg-thigh section from the bird, keeping them together as one large piece. Use a small sharp knife, preferably a fish knife, to cut the flesh away from the bone in each thigh, then snap the bone at the joint and remove it (save for stock). Position oven racks in the upper and lower thirds of the oven; preheat to 375 degrees. Have a two large roasting pans ready, one with a flat rack that fits inside it. Season the inside of each boned thigh-leg piece with salt and pepper, then use about 1/2 cup of the cooled stuffing to fill it. Close the flaps of meat and skin over the stuffing, using toothpicks to secure the flesh. Use the oil to lightly coat the stuffed leg pieces; place them seam side up on the rack inside the roasting pan. Use the remaining stuffing to form a large mound at the center of the remaining roasting pan. Drape the backbone-less turkey over the stuffing, so that it covers the stuffing completely and creates a kind of turkey tent. Grease the skin with a little of the oil, then season with the 1/2 teaspoon of salt and pepper to taste. Add the diced onion, carrots and celery around the turkey. Place the roasting pan with the stuffed legs on the upper rack and the pan with the whole turkey breast/stuffing on the lower rack. Roast for 30 minutes. While the turkey parts are roasting, combine the cider, hot pepper sauce and salt in a liquid measuring cup. Remove the pan of stuffed legs from the oven; turn them seam side down on the rack, then use a pastry brush to baste them with half of the cider mixture. Return them to the oven and roast for about 1 hour, or until an instant-read thermometer inserted into the drumstick meat registers 170 degrees. The legs should be browned and crisp. Transfer to a cutting board and let cool for a few minutes. 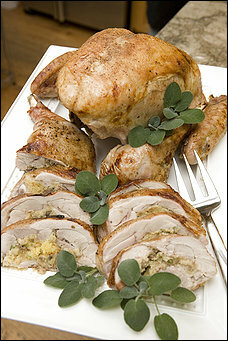 As soon as you have returned the stuffed and basted legs to the oven, remove the pan with the turkey breast/stuffing. Use the remaining cider mixture to baste the skin, then return the pan to the oven and roast for 1 hour, or until an instant-read thermometer inserted into the breast meat (close to the bone) registers 155 to 160 degrees. Transfer the whole turkey breast to a serving platter, and transfer the stuffing to a serving bowl; cover loosely with aluminum foil to keep warm. For the gravy: Pour any drippings from the roasting pan with the rack into the roasting pan with the vegetables. Place the filled roasting pan over medium heat (2 burners if needed). Carefully add the vermouth, using a wooden spatula to dislodge any browned bits from the bottom of the pan. Then add 3 cups of the rich turkey stock until heated through. Remove from the heat; strain through a fine-mesh strainer into a medium saucepan, discarding any solids. Place the saucepan over medium heat so the strained mixture heats through. Add the roasted giblets or gizzard, if desired, and allow to heat through. Then use an immersion (stick) blender to puree them in the liquid. Whisk together the potato starch or arrowroot and the port in a small measuring cup. Add to the saucepan, whisking, and cook until the liquid in the pan thickens slightly to form a gravy. Season with salt and pepper to taste. Reduce the heat and keep warm on the lowest setting. When ready to serve, discard the toothpicks in the stuffed legs, then, if desired, use needlenose pliers to carefully dislodge and remove any white tendons that should now be visible on the drumsticks. Arrange the legs in natural positions on either side of the turkey breast; if desired, spoon some of the warm gravy over the turkey pieces before taking the platter and the bowl of warm stuffing to the table. Pour the remaining gravy into a warmed gravy boat. To serve, cut the stuffed thighs crosswise into 1/2- or 3/4-inch slices that show stuffing at their center. Carve the remaining turkey at the table; pass the gravy at the table. Source: Washington Post adaption (November, 2007) of recipe from “Julia and Jacques Cooking at Home” (Knopf, 1997).